A lot of people have a hard time with removing hard water stains from outdoor windows. The good news is that there is hope, people have found many ways of removing water marks from windows. Here are a number of different products that people have used and had success with. 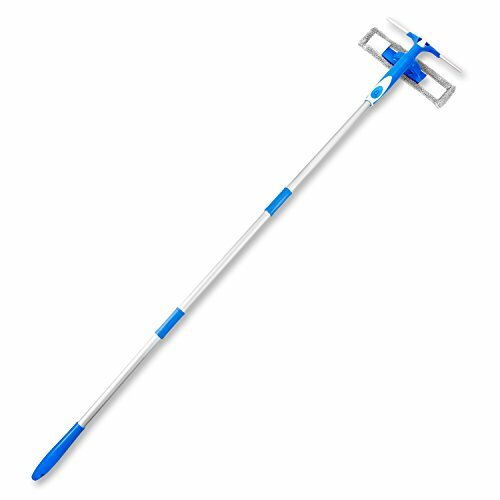 Our favorite tip: This inexpensive three-in-one window squeegee makes cleaning outside windows a breeze! The 5-ft handle helps you to reach high windows easily, and it includes a removable spray head. Tip #1: We had a lot of hard water buildup on our windows too that absolutely nothing would take off. Last year my husband actually scraped it off, which took hours! This year we used a commercial acid which took all the hard water stains off in minutes! They look brand new again! Tip #2: Automotive stores have glass polish to abrasively remove the spots if vinegar doesn’t work. Tip #3: My husband used to wash windows as a second job in our apartment complex and he discovered that oven cleaner cleans off anything! He said just be sure to spray it on your cleaning cloth, not directly on the window (you don’t want to get it on the vinyl or painted surfaces), and to rinse it well — oh and don’t forget to wear rubber gloves! Tip #5: Comet (scouring powder) removed water marks on the windows of our nearly 200 year old home – I think some of the old wavy glass is original. A little messy but vinegar, ammonia & a combination of these did not work. Just keep a bucket of clean water handy. Tip #7: We had windows that were streaked due to our pool cleaner spraying them and condensation. It was baked in due to eastern exposure to the sun. I tried Lime Away initially with little success. I then remembered how Sno-bol took rust stains out of my toilet that CLR or Lime Away didn’t even touch. What a success and much cheaper than Lime Away or CLR!!! Apply with a sponge and then work it in with the scrubber side of the sponge.